Cruise ships use this harbor as their port-of-call. It is located at the mouth of the Hule'ia Stream which creates a natural channel for the large ships. This harbor and nearby Niumalu Beach Park were pictured in the movie Raiders of the Lost Ark. The 12,000-square-ft. Aloha Center is just a block away from Nawiliwili Harbor's disembarkation center. It features an art gallery, coffee shop, clothing store, helicopter tour and moped rental outlets, arts and crafts vendors. Free shuttles run to car rental offices, Hilo Hatties, Kmart (beside Kuhio Grove), Walmart, and smaller malls from the pier. Rental car is the best way to really see the island-- and the only way to get to some remote (and scenic) sites. Difficult to get lost here, as there is only one main road around the island. Public bus The Kaua'i Bus operates a Public (Fixed Route) bus service and a Paratransit (Door-to-Door) bus service from Hanalei to Kekaha daily. The Kauai Bus now provides service to the Airport and limited service to Koloa and Poipu. People come to Kauai primarily for one thing: the beaches with their great snorkeling, surfing, swimming, and sunning. But Kauai also boasts more navigable rivers than the other Hawaiian Islands making kayaking very popular. There are plenty of free shuttles to the shopping centers. Some are just strip malls, some are more like mainland malls. 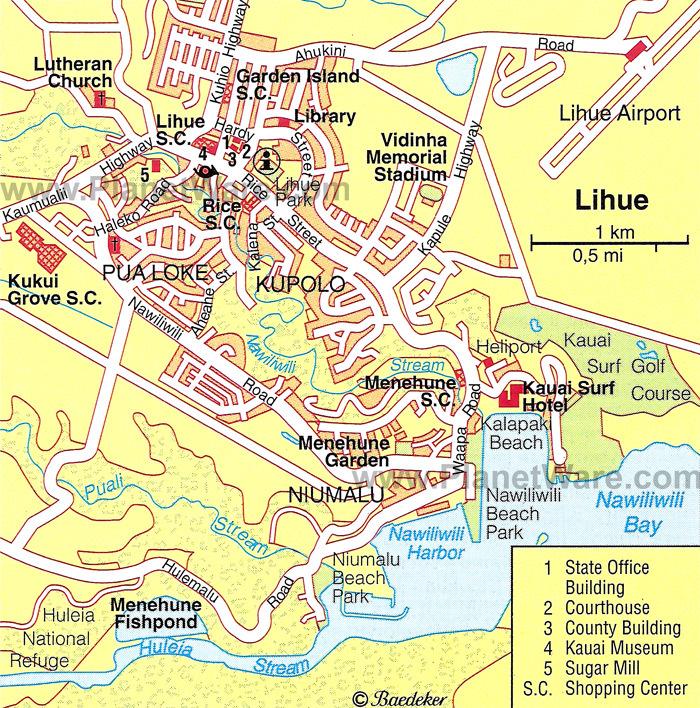 Kukui Grove Shopping Center and Lihue Shopping Center are as close to a mainland shopping mall as you will find on Kaua'i.